As I write this, I am being held captive in a condo, somewhere in California. Of all places. Do not ask me how I came to be here, as I cannot recall. I was but a wee one when I arrived. Though, I dare say, I have frightful memories of the automobile ride here. It was a terrifying experience. I’m pretty certain that I was blindfolded. Either that, or I was too bewildered to open my eyes. Indeed, I was shaking like a leaf, having never been in a vehicle before. So nervous was I, that I pooped in my trousers twice. Though, at the time, I wasn’t wearing any. 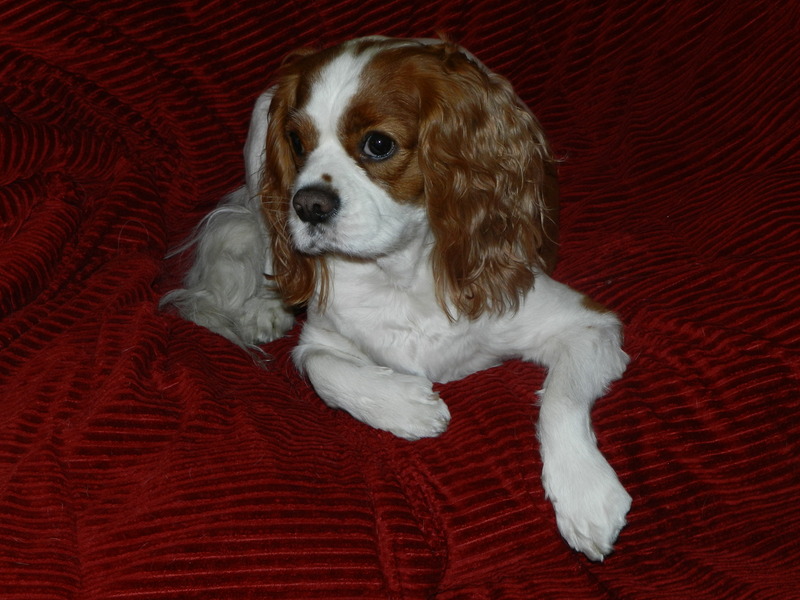 I am Henry, a King Charles Cavalier Spaniel, descended from royalty, and to the manor born. ‘Twas on a sunny day in spring that my life began. The cherry blossoms were in full bloom and sycamore trees swished gently in the breeze. For the first few weeks, all was well with the world. Then, quite suddenly, I was plucked from my mother’s bosom and taken from the only home I’d ever known. A tragedy, I know. I was eight weeks old and barely a lad. I cannot fathom why this happened, but I imagine it was a cruel joke, along the lines of The Prince and the Pauper. I, of course, being the prince. And now, here I am, trying to make the most of my pauper life, finding out how the other half live–and let me tell you, it’s quite ghastly at times. Maybe someday I will be able to return to take my rightful place on the throne. On the queen’s lap, of course (though they tell me I’m rather big for a Cavalier and would not be able to fit on her lap). Until then, I shall muddle through in this modest, cluttered home. I suppose I could do much worse. I try everyday to make the most of things, living with my people. After all, noblesse oblige. I live with three people. First and foremost, there’s Cook. She prepares all my meals, though I’m peeved that she never checks to see if my food has been poisoned. Those of noble blood cannot be too careful, you know, which is why I am forced to check my food myself. Each time I devour it, I am sure I am going to croak. But so far, that hasn’t happened. Cook has a blog, one that is all tangled. I don’t know why she calls it that. I’m hoping one day to have a blog of my own, so I can regale you with stories of my adventures here, including my vain attempts to get the attention of my humans, which isn’t easy when they are watching the telly. Also, living here is my Lady-in-Waiting. This is humiliating, because kings should not have Ladies-in-Waiting! But I come from a strong ilk, so I take such slights on the chin. In any case, my Lady-in-Waiting is seldom here. She leaves periodically for school, or something to that effect, and stays there for months at a time. I never know when she is going to leave or when she will return. As a captive, I am most often kept in the dark. Then there is my valet. A strapping, young gentleman, who Cook calls son. I am pleased to say, my valet is kind enough to see to my needs, as I have many. He feeds me on occasion—when Cook has the day off—and escorts me to the park, protecting me from the legions of unruly dogs that want to sniff my backside. It is, no doubt, their way of paying their respects to me. I rather enjoy taking my constitutional with my valet. For, unlike Cook, he often brings a tennis ball so that we can play fetch. Some might say I’m obsessed with tennis balls, but I’m just having a jolly, good time. Indeed, they are my passion. I can sniff out a tennis ball more than 20 feet away, and I fly off the handle when I do. The ball can be buried in the bushes, caked with soil and other dogs’ drool, yet I can always detect it. Cook has said, many a time, “If a tennis ball ever commits a murder, Henry will find it out.” And she is quite right! That is all for now. I do hope Cook allows me to post again. Perhaps she will, with your encouragement. In the meantime, if you see my mum, please let her know that I miss her dearly, and that I will always wear the mantle of my royal heritage with pride. Better yet, please send me a map so I can find my way home. Dear Totsy, this is music to my ears. You’ve given me hope. This time of year, it is hard not to pine for my mum, so I do appreciate your willingness to help me get back to the throne. Delighted you like my accent. I wish Cook was more appreciative of it, too. Alas, we can’t have everything, can we? I know times are different now, but I still think you have it pretty good. I wish I was a dog with my own cook and i would mine someone to do my laundry! Oh, I forgot I would be a dog, so I would not need anyone to do my laundry! Henry, you are one clever Cavalier! Of course, I don’t know many Cavaliers (one, to be exact, and he’s more tri-colored), but you sound like a dog I’d like to meet. My human plays ball with me, too, and she also refuses to sample my food (though she’s always bragging it up like she’d like to!). Perhaps we can be online buddies?? I’m a Sheltie — maybe you’ve seen my mom? or one of my siblings? Some are in dog shows; some do agility. Absolutely, I recognize both you and your mum. Cook loves her blog and sometimes reads it to me. I especially enjoy it when your mum tells stories about you. How lucky you are to have a yard to play in. I live in a condo and must wait for my valet to take me to the park before I can romp around. Online buddies is a capital idea! When do we start? ADORABLE and I do hope you find your way back to the throne! From your lips to the man upstairs. Mum would be so delighted to see me again. I know this because I miss her so and I rather assume she misses me, too. Would you like a companion? A black lab, perhaps, who chases after people and occasionally runs into moving vehicles. Or a kitten, who climbs straight up the center of the Christmas tree. I’m really getting getting stressed here. Garfield, the fat orange cat, who can barely manage to leap onto a couch after breakfast. Ah, they actually are interested in coming to see you. They’re really well behaved. The kitten only messes in the house every couple of hours, and, naturally, everyone blames it on me. Henry definitely deserves his own blog! Love it. I’m delighted I have your vote. Cook is tallying up the ballots now and I anticipate good news for me! Henry you are a very good writer so I hope you will post more. And please tell the Cook thank you for stopping by my blog and I really enjoyed reading her blog and look forward to more posts. And now I thank you for stopping by on the occasion of my first post. How very sweet of you! I have one question: Do you bark w/ a British Accent? Nice to meet you Henry. You are a very good writer so I hope you’ll get to do some more posts. We could have great fun in the park together playing with tennis balls, but I’d probably be one of those dogs who wanted to sniff your backside. Roxy, dear, how lovely to meet you at last! I’ve admired you for so long from afar. You are so photogenic. Indeed, I’m so delighted that we can connect at last though our blogs. Thank you for your comments in regard to my writing. And yes, Cook does make good food. My Lady makes delicious muffins. Unfortunately, I am not allowed to eat the ones with chocolate chips in them. Sigh. I do hope we can talk again! Henry, you look quite royal in your official portrait atop this post. Waiting to hear more. I appreciate you recognizing true royalty when you see it. I did request that Annie Leibovitz take the photo, but Cook had other ideas. Sigh. Love this blog! Thank you for sharing and Happy Holidays! Thank you, Vicki. I wish I could take full credit, but much of it goes to Cook and, if I’m not nice to her, who knows what she’ll feed me. Your Highness…perhaps someday I will pass along the name of my therapist…he specializes in the needs of neurotic canines. I don’t enjoy the car, or other dogs, or other animals, or people I don’t know…was that a squirrel I just saw? Jake, your kind words nearly caused me to pass out. Cook had to get me my smelling salts! Actually, I do now enjoy the car and love being driven around. But, seriously, I’m thrilled that your mum is sharing my story on Facebook. What a thrill for me, indeed, particularly when you consider this is just my first post. Thank you, so much, Jake, for the news! Please tell your mum that I’m pleased as punch that she enjoyed my post! Why, Jack, that would be quite pleasant, as I am eager to acquaint myself with fellow dog bloggers. We canine writers must stick together, you know. Perhaps we can plan a Midnight Bark as the dogs in “101 Dalmatians” did. I say, that film was splendid! Yes, dear sir, we would love to hear some more of your royal musings! Henry, you are one lucky prince to have a staff of three at your beck and call. I guess I’m lucky, too, even though my people are more like parents than employees. Still, I’d much rather be where I am, loved and spoiled, than back in that parking lot where I was dumped when I was a pup. Lola, I must confess, I have grown fond of these ol’ chaps. Cook sometimes calls me, “Sonny.” It’s a bit embarrassing when she says it in front of other dogs, but it feels good too. And I just adore my valet.